Reece Flanagan is mobbed by his team-mates after scoring the winner. Pictures by Sally Ellis. Colby Bishop holds off his marker. Pictures by Sally Ellis. Ahmed Obeng tries to connect with the ball in a dangerous area. Pictures by Sally Ellis. 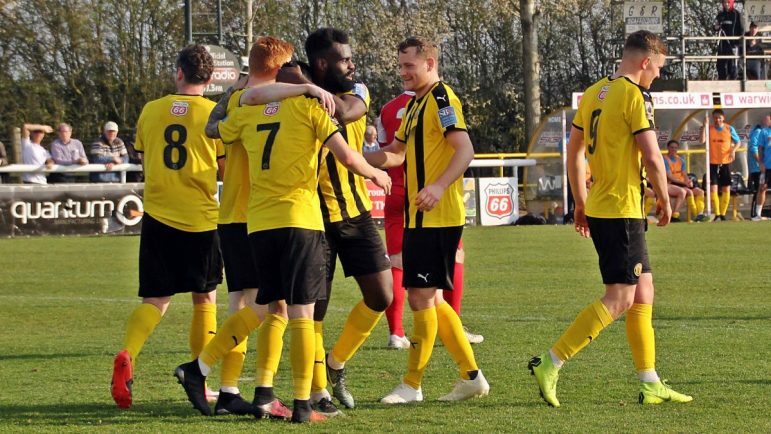 LEAMINGTON boss Paul Holleran said his side were good value for a 1-0 win over Ashton United in National League North – pulling them further away from the drop zone. Reece Flanagan’s goal in the final 20 minutes was enough to take the three points at the Phillips 66 Community Stadium, condemning the visitors to defeat and presenting them an even bigger mountain to climb to avoid relegation. Holleran praised the composure shown by his team to manage a decisive game and ensure the win was achieved. “I warned the players on Thursday night and this morning that this had all the makings of a real tight, difficult encounter for different reasons. “The magnitude of the game, the pitch, the conditions, the sun. Emotions were high and I thought we really controlled it well. “They’ve barely had a chance while we got in lots of good areas and a little bit of quality let us down, but I thought we managed the occasion – that’s something we’ve tried to work on this year, the emotional side of it. 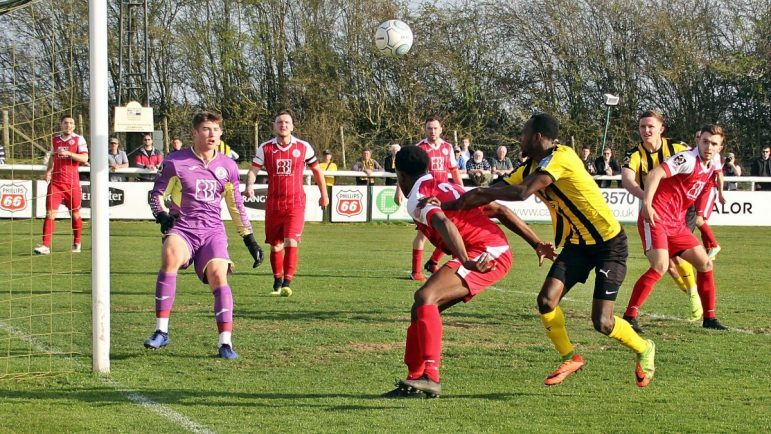 The Brakes manager thought his side did enough in the game to win by a bigger margin, but despite only winning the game by a single goal, says the result is the only thing that matters in helping ensure survival. “We’ve put ourselves in a very strong position. Jack Edwards received a booking early in the game to typify the kind of battle it was going to take from both sides to claim a crucial win in their respective campaigns. Ahmed Obeng played the ball through to Callum Gittings to send the first effort of the game on target, but it was an easy take for Ashton keeper George McMahon. 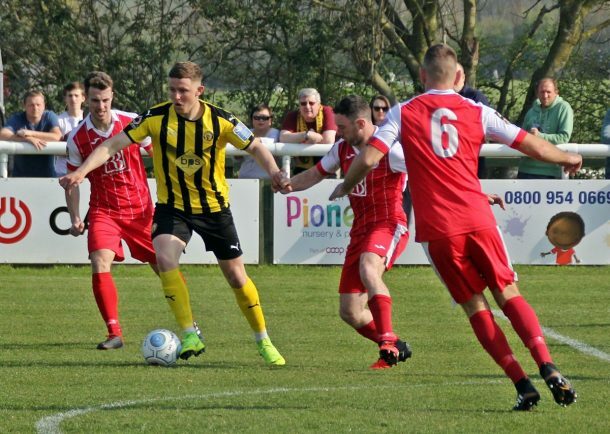 The visitors troubled the Brakes briefly with their first venture into the hosts penalty area, Aaron Chalmers sending a scissor kick over the bar after Leamington failed to clear the danger. Liam Towsett then curled Ashton’s first effort on target, but it was too close to Brakes goalkeeper Tony Breeden to trouble him. In the final action of the half, a corner that was blasted goalwards by Callum Gittings was felt with full force by Ashton defender Toby Lees, who caught the ball in the face. Obeng went close twice to open the second-half, his first effort resulting in a poor shot straight at McMahon after driving past his marker, before a similarly weak effort from the left of the penalty area. Sam Sheridan almost stunned the hosts when his solo run was followed by a deadly effort that clipped the top of the crossbar on its way out of play. A Leamington counter-attack led to a penalty shout, when the ball was flicked onto Javid Swaby-Neavin’s arm, but the calls were waved away. Chalmers threatened once more with a glanced header wide as the game remained goal-less, but Flanagan’s introduction changed the course of the contest. First, his free-kick from 25-yards out travelled narrowly wide of the post, and then, he put away the sole goal of the game. He was well placed to find the net on the rebound, after Jordan Murphy’s shot from a narrow angle was palmed into the substitute’s path – making no mistake from close range. Leamington held their nerve to record victory, despite a late effort from Liam Tomsett being fired at Breeden. The result takes the Brakes up to 17th in the table, 12 points away from the drop zone. They next head to 14th-placed Curzon Ashton on Saturday (3pm) – a side who edged Leamington in the reverse fixture in October. Meanwhile, it was announced this week that Birmingham City’s St. Andrew’s stadium will host the Birmingham Senior Challenge Cup final between the Brakes and Nuneaton Borough this year on Thursday May 2 (7:30pm). Both clubs have rich history in the competition, with Leamington the most recent winners out of the two sides, lifting 2017’s edition in a 5-4 win on penalties over Wolverhampton Wanderers.